The holiday season just seems to arrive quicker every year. 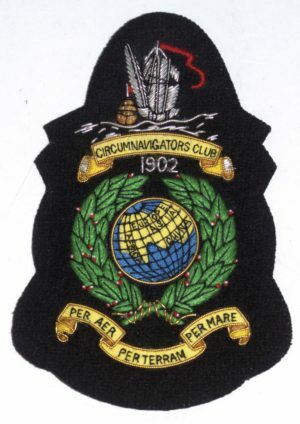 It’s a wonderful time and the Circumnavigators Club has been celebrating for 116 years. 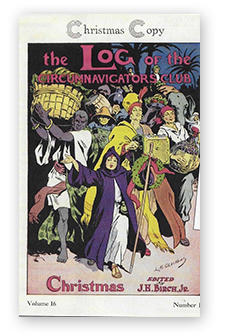 We found this old cover of the LOG , circa 1920, illustrated by member and famed artist L. M Glackens. 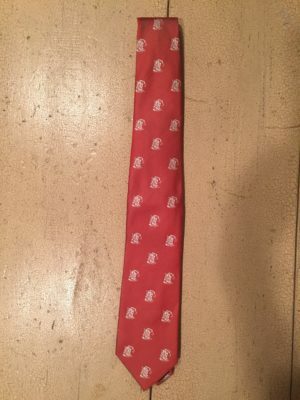 Apparently it shows an international crowd bearing gifts and it’s worth a good look. 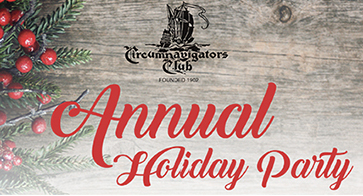 Happy Holidays to all our members, family and friends. 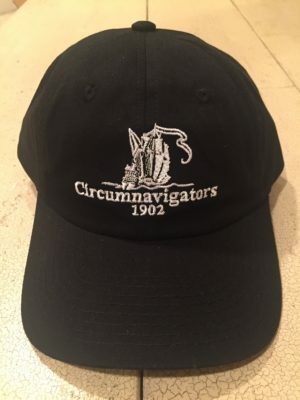 These Circumnavigators joined our Great Circle after the November Board of Governors meeting. 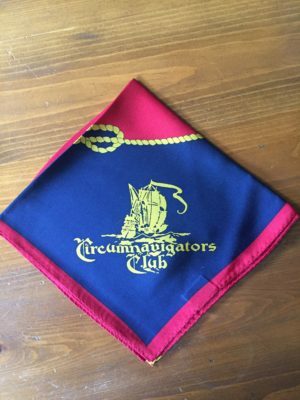 More about these new members in the next issue of The LOG. 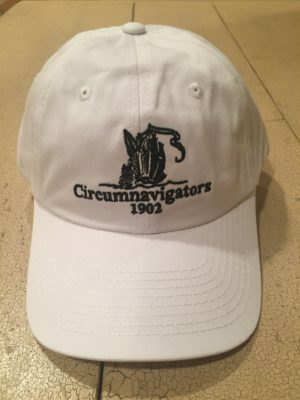 Circumnavigators at The Explorers Club! 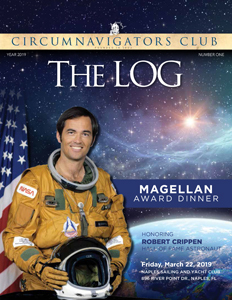 The Magellan Award dinner invitation is going in the mail soon. 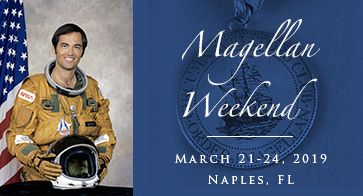 We hope you can attend this wonderful event in Naples, FL! 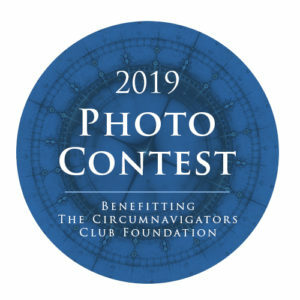 The Circumnavigators Foundation needs your help to continue its mission. 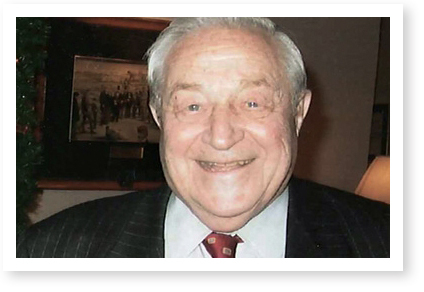 President Greg Rider is dedicating this year’s tax-deductible contributions to the memory of recently departed President Emeritus Charlie Blaisdell. 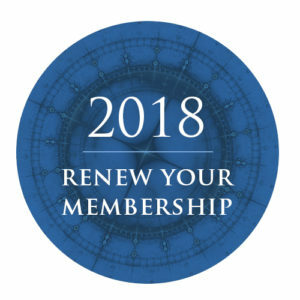 Members and friends can make a contribution via Pay Pal on the Club web site or by sending a check to the Foundation. 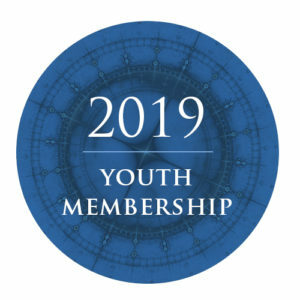 Thank you for your consideration. The Dalmatian Coast is a land of diverse beauty and friendly people. We recently spent nearly two weeks traveling and hiking along the rocky, mountainous coastline of Croatia. A young country with an ancient history, the Croatian coast, in summer is hot and humid – although one day we just missed a hailstorm atop a cool mountain! Our travels began with several days in Trogir, on the Adriatic just outside of Split. We stayed in the heart of Trogir’s Old Town, which has been declared a UNESCO World Heritage Site. From the colorful waterfront promenade in Trogir to a hike across the island of Ciovo, to the ancient Gospa od prizidnice chapel overlooking the Adriatic, our first days in Croatia were enchanting. 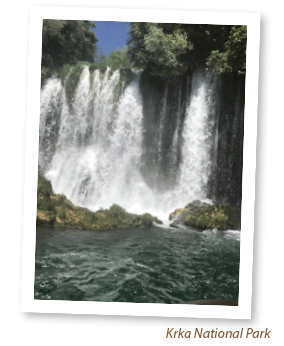 A magical day was spent in the Krka National Park. Our walk there consisted of a very long, winding boardwalk built almost entirely over water. At nearly every turn we came upon a new waterfall. The large sound of small frogs filled the air, as well as incredible birdsong. The three-hour walk ended with a boat ride complete with wild goats and a stop at the lovely 14th century monastery on Visavac Island. Heading down the coast, we spent a day in Split, visiting Diocletian’s Palace. Built in the 300s as a “retirement home” for the Roman Emperor, it, too, has been declared a UNESCO World Heritage Site. The cool cellars are comprised of the original stone. The main floor, largely open to the elements, retains its original form – perhaps the most surprising thing about the Palace and adjoining Medieval Town are the number of current inhabitants living in the ancient apartments! The town of Makarska is considered part of the Dalmatian Riviera. Mountains tower over the town and are reflected in the waters of the Adriatic. 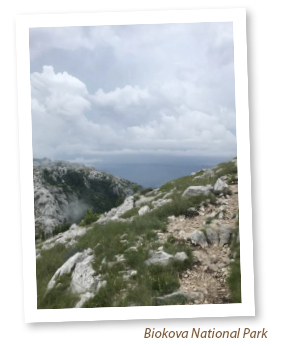 A challenging hike was to be had when we ascended over the ridge of a nearby mountain and then descended into the Cetina Canyon, where we were taken by boat to Omis, an old pirate stronghold. Another day, we went to the so-called “hinterlands” near the border with Bosnia. There, we hiked through fields of poppies and produce and vineyards, making our way to a lovely wine tasting and a riverside traditional “peka” meal of veal and potatoes. Finally, out of Makarska we hiked to the top of the 2nd tallest mountain in Croatia, in the Biokova National Park. In an otherworldly terrain, filled with wildflowers and open vistas, we saw the ruins of many old stone homes and farms. Lunch was at a hidden mountain hut – oddly named “Namaste”! The island of Mljet was our next stop. The southern end of Mljet is another National Park; there we hiked around two lakes and had lunch at a tiny island monastery. 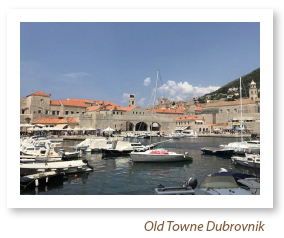 Our final destination was the ancient city of Dubrovnik. On one day, we went south, near the border of both Montenegro and Bosnia, where we took a hike along the coast to the small village of Cilipi. 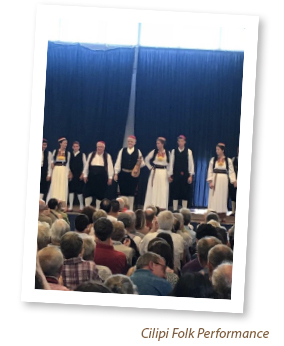 There we were treated to an old Croatian folk dancing performance. Our last day in Croatia was spent in Old Town Dubrovnik. cobblestone and very picturesque. Ancient churches and homes of nobility are contained within the walls. Croatia will remain to us a beautiful land. The lovely people, the spectacular landscapes,the great food, and the ever-present Adriatic…all combined to make a perfect holiday. 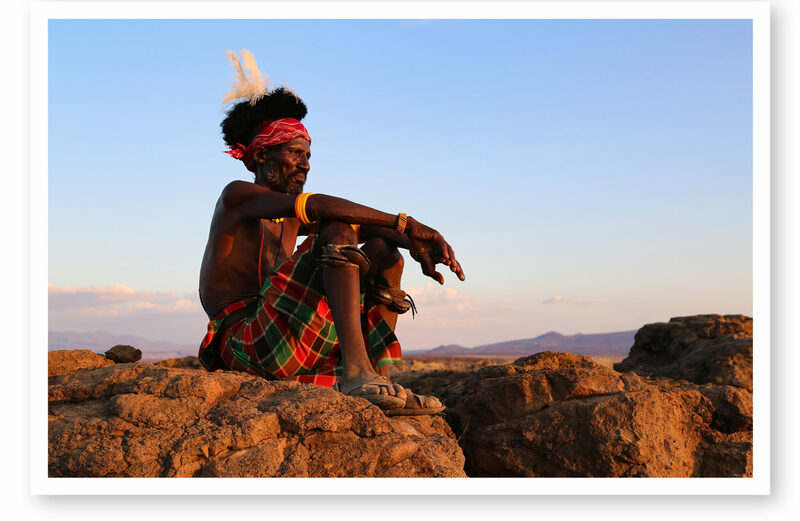 Circum Lisa Brighton, Michigan Chapter, caught this pensive shot of a tribesman in Kenya. More of Lisa’s spectacular tribal photos will run in the next issue of The Log.